The Juan de Fuca Festival of the Arts in Port Angeles is one of the most exciting events on the Olympic Peninsula. 2012 promises to be better than ever! The Two Man Gentlemen Band performs at the Juan de Fuca Festival of the Arts. The festival begins on Thursday, May 24, with a Pre-Festival Kickoff Event: African Rhythms — Celtic Soul. Early festival goers will be treated to Baka Beyond, a highly original Afro-Celtic danceband. Band members come from six different European and African countries. Keeping still while you listen is not an option. This could be worth an extra long weekend. Juan de Fuca Festival of the Arts celebrates the arts in all its mediums, but it is music that takes center stage. Allen Stone, the amazing 24 year son of a preacher man who is taking the world by the ears. Thomas Mapfumo and the Blacks Unlimited, known as the Lion of Zimbabwe. Locarno, featuring Tom Landa and an exciting blend of Mexican, Cuban Son, Folk Music, Pop and Funk. The Two Man Gentlemen Band, playing hot, raucous, retro swing. See Locarno at the Juan de Fuca Festival of the Arts. Abby Mae and the Homeschool Boys. Sheer exuberance. Zili Misik. 7 women from Boston draw from Haitian, Brazilian and West African traditions to create a sound uniquely its own. A Street Fair runs throughout the festival, boasting more than 60 food, artisan and craft booths. The Street Fair opens at noon on Friday, May 25 and continues through 5 p.m. on Memorial Day. Look for Olympic Peninsula Wineries and pick up a bottle of Washington State Wine to enjoy at the end of your day. Juan de Fuca After Hours stretches the music into the night. Four downtown establishments will host festival performers from 10 p.m. to midnight or beyond. Admittance is free with a Festival Pass. There is no need to stop dancing just because the sun goes down! The setting of the festival is lovely, with the stunning Olympic Mountains in one direction and Vancouver Island and the Strait of Juan de Fuca in the other. When you need to rest those dancing feet, find a good spot to take in the views. All ages are welcome at the Juan de Fuca Festival. Music is for everyone. 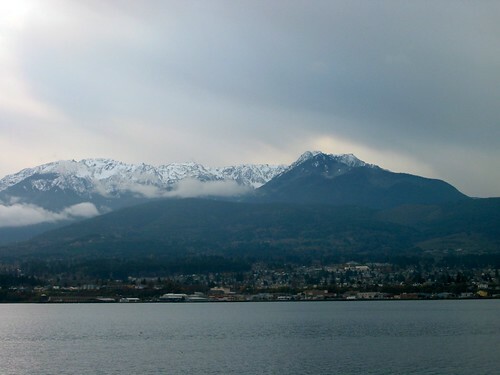 The Juan de Fuca Festival is nestled between the Olympic Mountains and the Strait of Juan de Fuca. Additional information is available at Juan de Fuca Festival of the Arts.